With imagery as dense as blood clots, Burbridge imbues the cadences of demotic speech with the whisky-breathed lilt of the fiddle or the glass-eyed slur of the needle to hold a mirror to 21st-century British urban life with more incisive results than any number of government working parties could ever hope to attain. Nick Burbridge's poetry is no stranger to Orbis readers and his third collection is full of the wit, verve and character we've come to expect from his work…Burbridge is a versatile artist, and one gets the full spectrum of moods, of light and shades, in this skilful collection. This substantial new volume from Anglo-Irish poet, playwright, novelist, journalist, short story and song writer Nick Burbridge (when does he sleep?) achieves a remarkable consistency of tone despite its considerable range of subject matter. A collection as delightful as it is sometimes disturbing. …highly literate and precisely articulate…an almost Joycean literary grandeur. 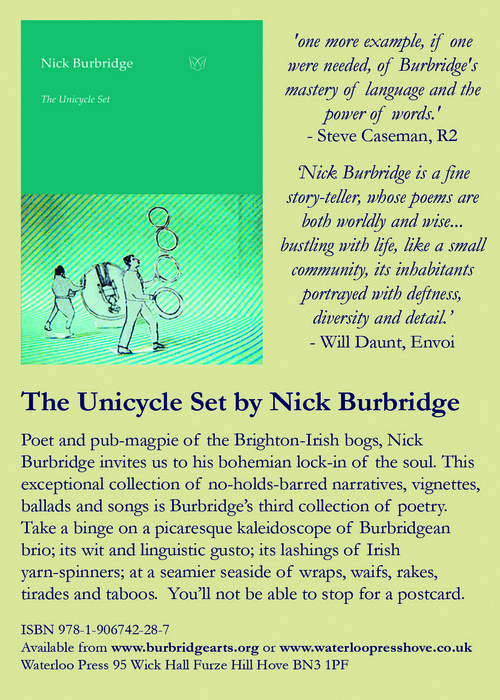 The Unicycle Set, Nick Burbridge, Waterloo Press, 84 pp. £10. Official publication - February 2011. Signed copies are now available, using the contact form on this website.